I don’t know about you, but January often feels like kind of a let down with regards to decorating. In December my home is full of lights, decorations, and fun crafts. After New Year’s we take down all of our decorations and our house seems so bare. This year I have decided to do a little winter decorating. I started by making a winter wreath. Because I am cheap frugal, I challenged myself to only use materials I already had. As a result, I created this T-shirt wreath. Even the wreath form was made using items from around the house. 1. 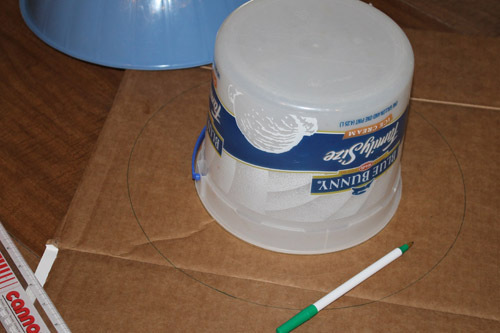 Trace circles onto the cardboard using the two bowls of different sizes. Try to make sure that the smaller bowl is centered inside the larger circle. 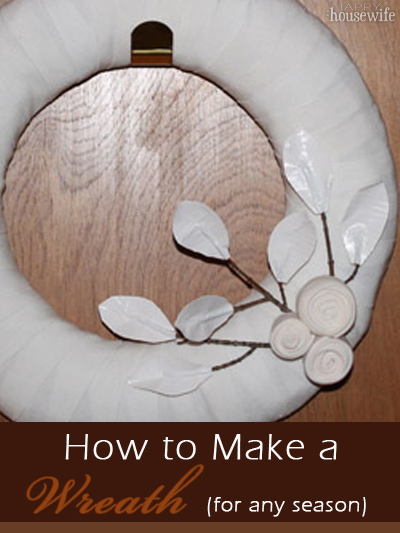 You can make the wreath any size you want. The outer diameter of my wreath is 13 inches. 2. 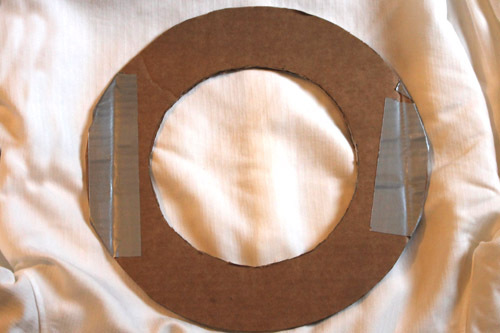 Cut around the outer circle and then cut out the inner circle. I used scissors, but an box cutter would work as well. 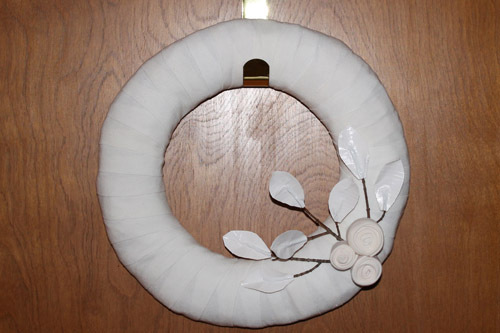 The picture below is what my wreath form looked like when I was finished. I used duct tape on the folded parts of the cardboard for extra stability since I had used a box that I opened up to make it big enough. If you have a very large piece of solid cardboard you won’t need to do that. Now, we need to give the wreath some shape. This is where the grocery bags and duct tape come into play. 3. 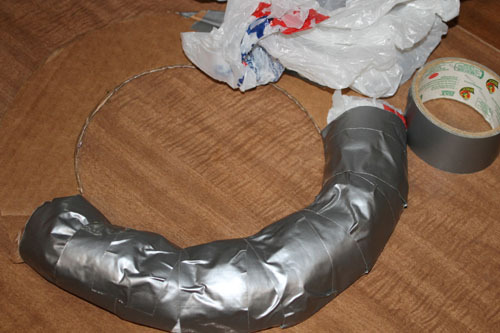 Take one plastic bag at a time, wad it up into a ball, and then attach it to the cardboard using duct tape. Continue all the way around until the wreath is completely covered. This is what your wreath will look like when you are finished. 4. Hot glue the quilt batting over the wreath form. I used batting scraps I had saved from a previous quilting project. 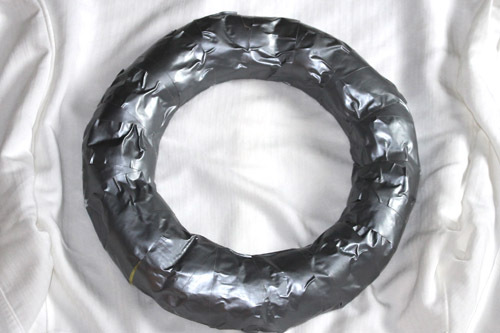 We now have a wreath form made of mostly upcycled materials. A little effort saved us the $5 we would have spent at the store on a pre-made wreath form. The next thing we need to do is cover the wreath with the T-shirt. 5. Cut the T-shirt. 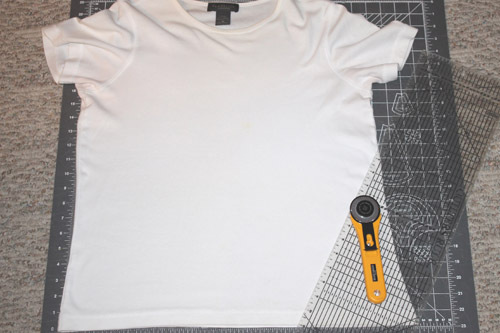 Use a rotary cutter to cut off the bottom and sides. 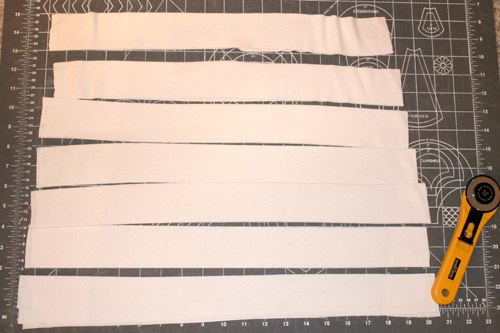 Then, cut the T-shirt, horizontally, into 2 inch strips. It really doesn’t matter how long the strips are, just make sure they are 2 inches wide. 6. 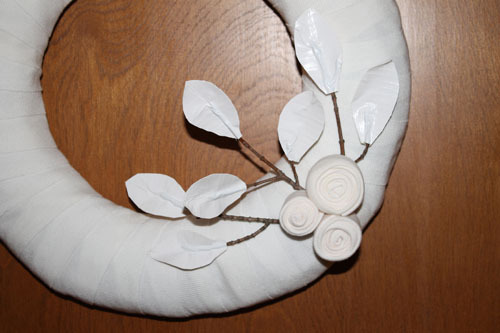 Take one T-shirt strip at a time and wrap it around the wreath form, overlapping the previous round by about an inch. 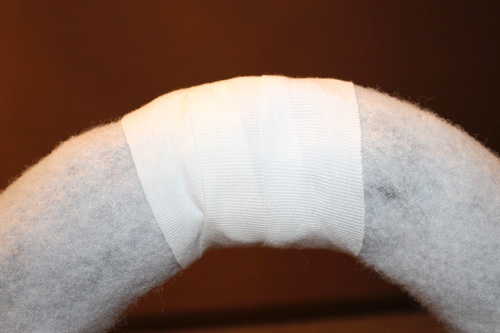 At the beginning and end of each strip, use a straight pin to attach it to the back of the wreath. If your T-shirt strip ends at an odd spot, simply cut it so that it ends at the back of the wreath because you don’t want any pins on the front of the wreath. 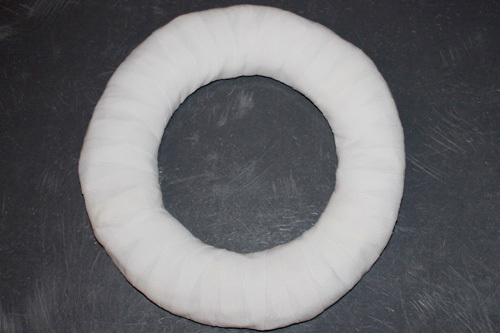 Below is a picture of the back of the wreath I made after I had one T-shirt strip attached. 7. Continue wrapping T-shirt strips around the wreath until it has been completely covered with the T-shirt strips. 8. Hot glue any loose ends of the T-shirt strips to the back of the wreath. 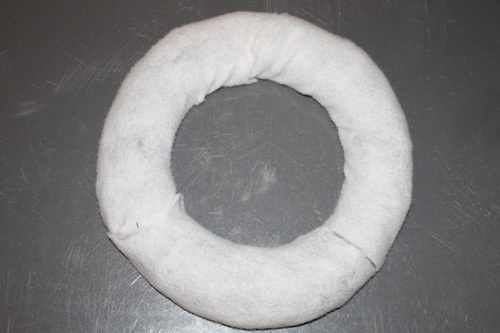 This is what your wreath should look like after you have covered the wreath form with T-shirt strips. It is kind of plain right now, but it is really a blank slate that you can now embellish however you want. To further embellish my wreath I made three flowers of varying sizes out of rolled up T-shirt strips. 9. 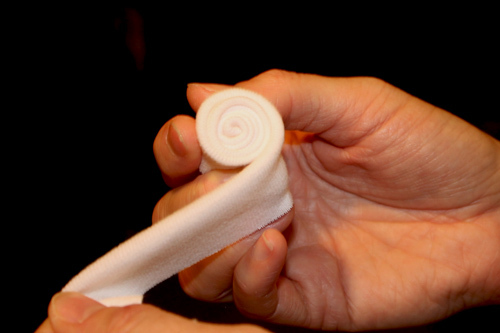 To make a flower, fold a T-shirt strip in half horizontally and start rolling it up until it is the size you want. 10. 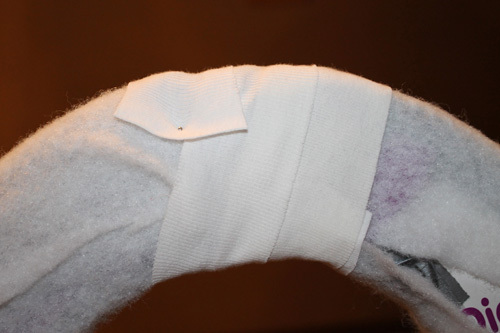 Use hot glue to secure the ends. I hot glued my three T-shirt flowers together, but I thought the wreath needed a little something more before gluing them on. I had seen winter branches embellished with duct tape leaves over at Nesting Place and thought they would be a great addition to my winter wreath. I chose 3 small twigs and made a total of 7 leaves. Then I hot glued them to the wreath and glued the T-shirt flowers to the ends of the twigs. This wreath has been a fun addition to my home and is helping to make January a little less dreary. The great thing about this method of wreath making is that you can customize it for any season. Use a red T-shirt for winter, orange for fall, pink for spring. The possibilities are endless and, because you will be using upcycled materials, you can afford to make more than one no matter what your budget.